At 44 hectares and home to the Des Renford Leisure Centre, Heffron Park is the largest sporting reserve in Randwick City. The new facility will cater for all levels of players in our community, from beginners through to competition standard. 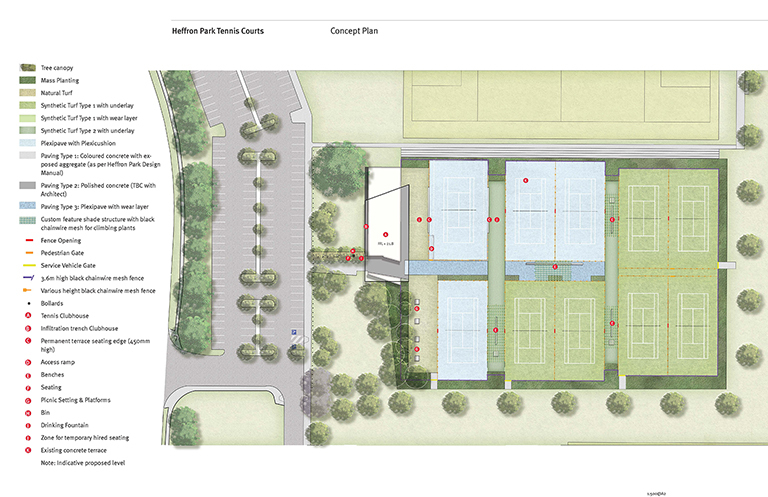 The existing outdated tennis facility will be demolished to make way for future new indoor sports facilities and a new sports field. Construction is well underway and likely to be complete by late 2018 or early 2019. For further information, please contact the Buildings for our Community project team on 1300 722 542. Download a PDF version PDF, 6167.1 KB of the Masterplan.